� Gibb's full given name is Jacob Spiker Gibb. � Gibb was one of two AVP players to have won at least one title every year from 2004-2009 (along with Todd Rogers). � In 2005 Gibb won in his first tournament alongside Stein Metzger, then repeated the accomplishment in 2006 with Rosenthal. � Gibb and Rosenthal won seven FIVB medals in their first six seasons (2006-11), then won five medals in their last year together (2012). � Gibb was the only player ranked in the top five on the AVP for the four years between 2004-07. � Gibb and Rosenthal won a bronze medal in Quebec in 2011, helping the USA to its first ever podium sweep on the FIVB Tour. � Gibb and Casey Patterson won 27 consecutive AVP matches from August 2014 through August 2015, claiming five straight titles in that span. 2018: Gibb and Taylor Crabb played six AVP tournaments together, winning twice and finishing second twice. Gibb tied for the lead on the AVP Tour in blocks (1.92 per set), ranked fourth in aces (.85 per set) and fifth in hitting percentage (.483). On the FIVB Tour Gibb and Crabb played nine tournaments with a best of fourth. 2017: Gibb and Taylor Crabb formed a partnership, and they won two of their first four AVP events as partners. For the season they had four semifinal appearances in six tournaments, and lost just six matches all year. Gibb was third in blocks (2.09 per set), seventh in aces (.66 per set), and 10th in hitting percentage (.442). Internationally Gibb and Crabb placed fifth three times in their six FIVB events. 2015: Gibb and Patterson won the first two AVP events of the season, extending their streak to five consecutive wins. Their match winning streak was halted at 27 in a row in their next event. In six AVP tournaments they advanced to the semifinals five times, and ended as the tour's second ranked team. Gibb finished the season second in blocks per set (1.92), seventh in aces per set (.60) and eighth in hitting percentage (.424). On the FIVB Tour, Gibb and Patterson played in 10 events, winning one gold and one silver. 2014: Gibb continued his partnership with Patterson, and the duo began the AVP season with a second, a third, a win, and then a seventh place finish. They concluded the AVP season with three straight wins after winning 15 consecutive matches. The only team to win multiple titles, Gibb and Patterson ended the year as the top-ranked team. Gibb was second in hitting percentage (.472), sixth in aces (.68 per game) and seventh in blocks (1.63 per game). On the FIVB Tour Gibb and Patterson played in 10 events, winning a bronze in Poland and placing fifth once. 2013: Gibb formed a partnership with Casey Patterson, and they won in just their second event together, an FIVB event in Shanghai. The duo advanced to four semifinals on the FIVB Tour, finishing once in each of the top four positions. They placed 17th in the World Championships and ended as the fourth-ranked team on tour and the highest U.S. team. On the AVP Tour Gibb and Patterson were the only team to advance to all seven semifinals and were the top-ranked team. They won four titles, all in consecutive events. They ended the year with a 30-5 match record which included a streak of 16 straight wins. Gibb was fifth on the tour in blocks per game (1.77). 2012: Gibb and Rosenthal played in 12 FIVB events, advancing to seven semifinals and winning twice. The duo won the season points title, becoming just the third team from the U.S. to accomplish that feat. The duo won four straight medals leading up to the London Olympics, where they finished in fifth place. 2011: Gibb and Casey Patterson won 27 consecutive AVP matches from August 2014 through5 August 2015, claiming five straight titles in that span. Gibb and Rosenthal finished 17th in the season opener in Brazil, then rebounded in Shanghai with a silver, their first semifinal appearance since May 2009, ending a drought of 15 straight events without playing for a medal. The duo placed 17th in the World Champsionships in Rome, and won a bronze in Quebec. They ended the year as the 10th-ranked team on the FIVB in season points. 2010: Began the season with a ninth place finish in the AVP season opener, then placed second in Santa Barbara. Advanced to three semifinals in six AVP events. Playing with Rosenthal, the duo had a best of fifth four times on the FIVB Tour, including three Grand Slams. 2009: After four second-place finishes in the first six AVP events, Gibb and Rosenthal won the Manhattan Beach Open. The advanced to three semifinals following that, and each time was after suffering an early loss in the winner's bracket. The duo won a bronze medal in Poland then placed ninth in the World Championships in Stavanger, being eliminated by the eventual champions. With Rosenthal injured for the AVP season finale, Gibb paired with Matt Olson in Glendale. Gibb finished the season ranked third in hitting percentage (.450) and sixth in blocks per game (1.44). 2008: Gibb played in seven semifinals with Rosenthal, winning titles in Atlanta, Long Beach and San Francisco. They also won the Cuervo Gold Crown Championships following the Huntington Beach event. For the third time in his career, Gibb finished second in the individual event. 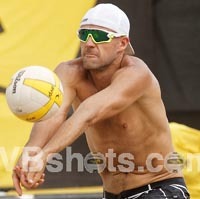 Due to missing several events in his effort to qualify for the Olympics, Gibb ended the season ranked 12th on the AVP Tour. He was fifth in blocks per game (1.80) and sixth in aces per game (.62). On the FIVB Tour, Gibb and Rosenthal made the semifinals in their first two tournaments, placing fourth before winning in Prague. In the Grand Slam in Stavanger, Norway, the duo placed fifth, and they ended the qualifying process as the 12th-highest ranked team in the world. In the Beijing Olympics, the duo won all three pool play matches and their first round match before being eliminated by the defending Gold Medalists, placing fifth. 2007: Gibb and Rosenthal started the season with four consecutive second-place finishes. Following another second-place, the duo won consecutive tournaments in Tampa and Atlanta. The pair had four more semifinals, including two championship matches, and Gibb ended as the fifth-ranked player. He was second in blocks per game (1.96). On the FIVB Tour, the tandem played in six tournaments, placing fifth twice as their best finishes, including the World Championships in Gstaad, Switzerland. 2006: Gibb began playing with Sean Rosenthal, and repeated his feat from a year ago, winning in Ft. Lauderdale in his first tournament with his new partner, with the $50,000 prize money the largest payout since 1997. But they fell just short in the next event, placing second. They advanced to six more semifinals during the season, including four more finals. Gibb was the fifth-ranked player on tour. He was second in hitting percentage (.479) and fifth in blocks per game (1.93). On the FIVB Tour Gibb and Rosenthal lost their first three matches of the season, finishing 25th in their first event. But in their third tournament, in a Grand Slam in Paris, they finished second. To conclude the international season, they placed second in Vitoria, Brazil before winning in Acapulco. Gibb was chosen as the FIVB Top Rookie. 2005: Switched partners to Stein Metzger, and in the season opener in Ft. Lauderdale, the pair bounced back from a second-round defeat to win the title after six straight wins over teams seeded in the top 10. The duo won again in the next tournament, in Tempe, as well as later in the season in Belmar and Manhattan Beach. In 13 team events the pair was in the semifinals 11 times, including six championship match appearances. Gibb and Metzger were both ranked as the top players, and Gibb's victory total (four) and earnings ($110,950) led the tour. Gibb again finished second in the individual event. He was third in blocks per game (2.17). Gibb was named the AVP Most Valuable Player and the team was the Team of the Year. On the FIVB Tour, they played seven times, winning three medals. In a Grand Slam in Paris, the duo placed second, then claimed two bronze medals in Salvador, Brazil and Cape Town. 2004: Played with Jewell, and rebounded from a 13th-place finish in the season opener to finish third in Tempe in the second event. Then in the third tournament in Austin, the duo won after knocking off four of the top five seeded teams, and as the 12th-seeded team became one of the lowest seeded teams to win an AVP event. The pair advanced to four additional semifinals, including the championship match in Belmar. Gibb was the third-ranked player on tour and in the individual event to end the season finished second. He was third on the tour in blocks per game (1.99) and was chosed the AVP's Most Improved Player. 2003: Gibb started the season with a pair of events with Ty Loomis, advancing from the qualifier both times, including a ninth in the season opener. He then partnered with Adam Jewell, and in their first event they knocked off the top-seeded team en route to a third-place finish in Hermosa Beach. The duo also placed fifth in Belmar, and Gibb ended as the 19th-ranked player on tour. 2002: In five AVP events with Daniel, Gibb made one main draw, finishing 25th. 2001: Played four times with Daniel, making one main draw and finishing 25th. 2000: Gibb began his pro beach volleyball career with Mike Daniel, playing in five AVP events, including two main draws with a best of 17th. � In the 2008 Beijing Olympics Gibb qualified with Sean Rosenthal as the number seven seed. The duo went 3-0 in pool play, then 1-1 in bracket play, placing fifth. � In the 2012 London Olympics Gibb qualified with Sean Rosenthal as the fourth seed. The duo went 2-1 in pool play, then 1-1 in bracket play, placing fifth. � In the 2016 Rio Olympics Gibb qualified with Casey Patterson as the number six seed. The duo went 1-2 in pool play, placing 19th. Personal: Gibb is one of the few players on the AVP Tour that did not play volleyball in college. Instead, he grew up in Bountiful, Utah playing golf and basketball. It was not until he turned 21 that he took up the sport of beach volleyball with his twin brother, Coleman, who is six inches shorter. He is the youngest of 11 children (six boys, five girls). All of the boys in the family have the middle name Spiker, which is his mother's maiden name. He married Jane, who also played on the AVP Tour, in 2000 and they have two kids; Crosby (August 2012) and Cora Jane (January 2015).